What this works out to is a great way to frame the New Year. Christmas is almost like a prelude. 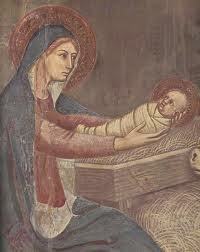 The New Year is associated with Mary: who is, precisely, what Jesus means for us. Let us make every new year a Marian year, joining Mary to live in light of the coming of Christ. This is a big deal, both in the Bible and in the Liturgy. In Matthew’s account of the Nativity, which focuses on Joseph, this is precisely his task: “Joseph, son of David,” says the angel, “fear not to take Mary as wife . . . . She shall bring forth a son, and you shall call his name Jesus. . . . And they shall call his name Emmanuel . . . . She brought forth her firstborn son: and he [Joseph] called his name Jesus.” Joseph must name Jesus. Luke’s Gospel, focusing on Mary, also culminates in her giving him this name above all names. But Mary relates to the word in another way. Our Gospel reading, leading up to the circumcision, begins with the shepherds “find[ing] Mary and Joseph, and the infant lying in the manger.” This is appropriate for the feast of Mary Mother of God: when we find Jesus, we find Mary beside him. But the rest of the reading gives a fabulous insight into who Mary is. The shepherds “made known the message” – the Greek rhema focuses on the words that the angels spoke to them. And those who “heard it were amazed”: the sight of the child becomes amazing when we hear the words that explain who he is. A baby is not amazing: but these words make him amazing. And then Mary “kept all these things, reflecting on them in her heart.” Unfortunately, the translation is not very literal: in the Greek, she keeps the words, the rhemata. That’s what she keeps in her heart. In college we used to wonder at a statue of Mary holding a rosary. “Did she pray, ‘Hail me, full of grace’?” we joked. And she will “call his name Jesus,” the word above words. One of the driving insights of this webpage is the great phrase from the Rule of St. Benedict’s nineteenth chapter, “On the Discipline of Psalming”: “let us so stand to sing, that our mind may be in harmony with our voice.” In short, true prayer ponders the words: the divine words given to us. With Mary, let us ponder the other readings tomorrow. “The LORD let his face shine upon you”: those words should be pondered! May he “give you his peace”: hold those words in your heart! The Spirit comes to let us speak – the word in Galatians is for how a raven (or a parrot) croaks words it barely understands – “Abba, Father.” We babble, we barely understand – but let us, with Mary, ponder all these words in our heart. And above all, the name of Jesus, “savior.” Mary pondered that name, that word, deep in her heart. Could you make a New Year’s resolution about finding more space to ponder God’s word?